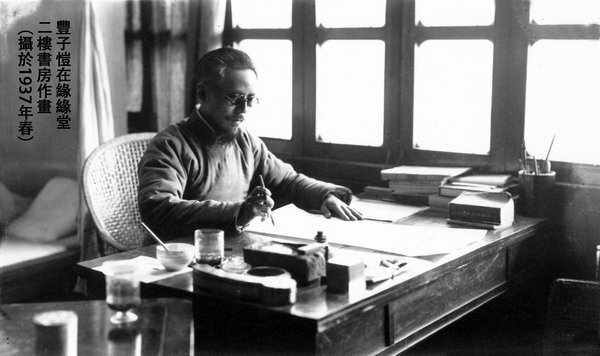 Feng Zikai in his study in 1937. 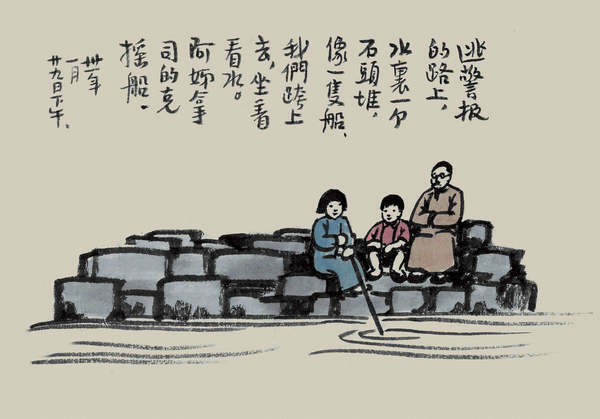 Feng Zikai, the late writer, painter, music educator and translator, is among modern China's most celebrated cultural figures. Feng (1898-1975) wrote his essays largely drawing from his daily experiences and has provided insights in an approachable, delightful manner. His ink paintings laud the beauty of life in a poetic way while offering witty observations on the complexity of human nature. The intelligence, generosity and gentle sarcasm that characterizes Feng's oeuvre have created a recognizable style that appeals to many generations of Chinese, healing their hearts, whether during chaotic times or in a fast-paced metropolis. Feng's extensive fan following, regardless of age or education, is contributing to the popularity of a series of commemorative exhibitions on the 120th anniversary of his birth this year. Two shows ended on Oct 3 in Hong Kong, one of which witnessed a waiting line at the venue, the Asia Society Hong Kong Center, according to Wang Yizhu, the exhibition curator and a friend of the Feng family that lent the bulk of the exhibited works. An art piece from the Paintings for Engou album on show in Beijing. A Fair Land This Is, a third retrospective, currently underway at the Zhejiang Art Museum in Hangzhou, and which runs through Nov 11, focuses on the emotional connection between Feng and his second hometown in eastern China where the exhibition is being held. Feng attended a normal school in Hangzhou, not far from his native town of Tongxiang. Hangzhou's landscape and leisurely pace of life helped shape the lighthearted tone in his paintings. Another ongoing exhibition, Human Comedies, at the National Art Museum of China in Beijing through Nov 4, presents an uncommon juxtaposition of three painting albums－Big Tree, Saving Lives and Paintings for Engou－each from a different collector, but which contribute significantly to a thorough understanding of Feng's views of the world. The series' last show, Tongxiang My Love, will open to the public on Nov 9. In 2012, an exhibition of his works occupied four floors of the Hong Kong Museum of Art. 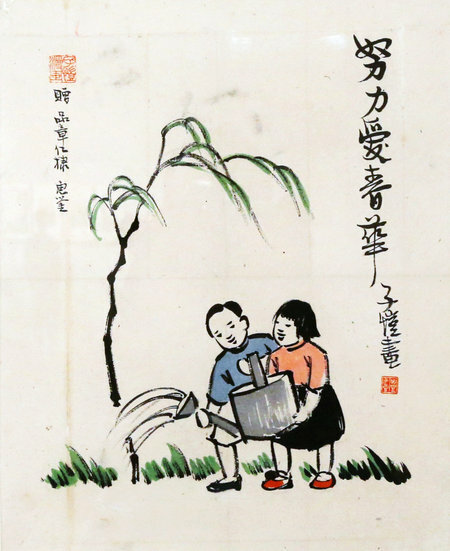 Valuable Spring (Youth), a painting on show from NAMOC's collection. Wang, the curator of the current series, says she was "moved to tears" when visiting the exhibition back then. She says that Feng is hailed as a man of eminence in cultural circles, but being modest about his talent he may not have wanted to be seen as an icon "worshipped at the sacred temple of art". Feng's paintings are exuberant with poetic delicacy. He abandoned the sophisticated brushwork of classic Chinese paintings, but retained the liubai (leaving blank areas) approach. He adopted from Western oil paintings the styles of simple, straightforward composition and sketchy, clean-cut strokes. His works either depict the tranquil, delightful moments of life, no matter how insignificant they look, or gently critique social issues, such as spoiling children and the income gap. His contribution to China's inkbrush art ushered in a modern genre, making it reality-oriented and, as such, more relevant to people. Lhasa, capital city of Southwest China's Tibet autonomous region, has entered the worship season. Buddhists from across Tibet come to the Potala Palace and Jokhang Temple for worship. The first Hello Kitty theme park outside Japan officially opened on Thursday, the first day of the year in the Anji county, Huzhou city, East China's Zhejiang province.